I couldn’t find anything about who Joan Mills was, but she must have had memories of Christmas that were similar to my own. For me, no other time of year brings as deep a connection to childhood. Perhaps it’s the combination of scents, sights and sounds unique to the season that can so quickly and directly tap into the subconscious. Or maybe we see ourselves reflected in the young ones who so enjoy the excitement, free from all the cares and obligations and exhaustion that inevitably accompany our adult experiences of holidays. As Charles Dickens said, it’s good to be children sometimes. I hope that you can grab a few minutes tonight to sit quietly and think back on your earliest memories of this season. It’s likely to be a bittersweet recollection. Not everything in the past was happy, and even when joy predominates, many of us are looking back at that joy through the lens of later sorrows we could not have imagined at such a tender age. Regardless of whether our mind’s eyes see our six-year-old selves living in innocent bliss, harsh reality or somewhere in between, we can remember and celebrate the child who is, after all, still very much alive somewhere inside us. I’m thankful to be an adult now, but also grateful to the child inside me who taught me so much, and continues to teach me. I invite you to join me in allowing that inner child to play a large role in the season, however you choose to observe it, and maybe a little bit of the lost enchantment will awaken. Just to give you a jump start (and with the help of Jacquie Lawson, whose cards I have sent out via this blog each Christmas) I invite you to choose any or all of these greetings that may bring out the kid in you. For a fanciful look at Santa’s workshop and the elves getting ready for the big night tonight, you can view this card— and maybe even work the puzzle at the end. Did you love kaleidoscopes as much as I did when I was a child? If so, you may want to enjoy this digital version of a childhood favorite. Or how about a ride through the English countryside? Hop aboard the fabled “one horse open sleigh” for a quick virtual adventure. Thanks for being here with us! I wish you a very happy Christmas, and a year full of blessings in 2016. Thank you! Sorry I missed this comment earlier…there were three I didn’t see. Thanks for stopping by! Julia, thank you for letting me enjoy all the Christmas cards. I must say though the kaleidoscope was my favorite. MERRY CHRISTMAS EVE!!!! Thank you Cherie! I hope your Christmas was lovely. I am so happy you enjoy them, Ann! I just love Jacquie Lawson. My friend Amy (who comments frequently here) first sent me a JL card years ago while she lived in Germany. I was an instant fan. I wish you a healthy and happy 2016! 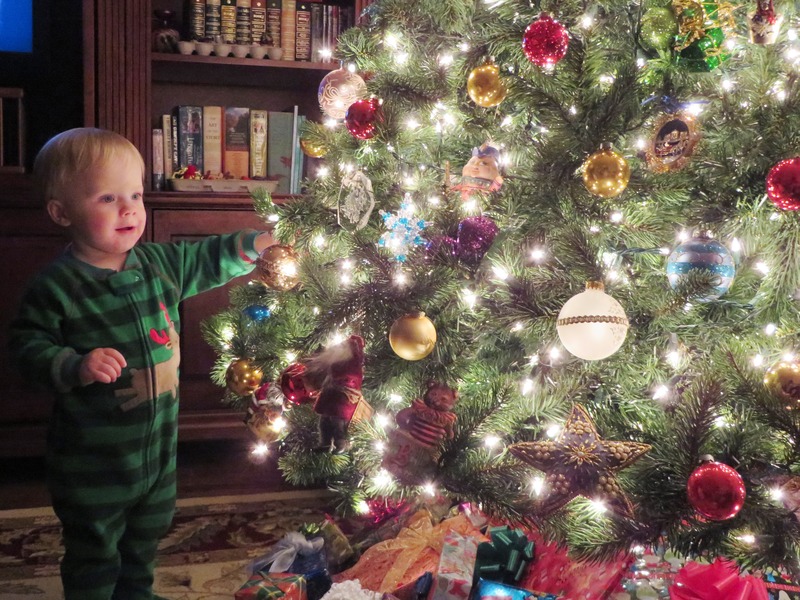 Love the picture of Grady with the tree. Merry Christmas to the Denton family. Love and hugs to all. Thank you Carolyn. I got some more photos of him by this year’s tree (at our York home) and it’s fun to compare and see how much he has grown. Hope the Millers are enjoying the holiday season! Love to all you! Merry Christmas to you and yours Julia. I’ve sent a tiny gift that may or may not have arrived yet: a subscription to a magazine I stumbled upon (Tea Time). I hope it’s not something you already have. J, how sweet of you! NO I do not already have it; I have seen the magazine advertised somewhere (I forgot where) but I’ve never had an issue to enjoy. Thank you! I mailed your little package this past weekend, and oddly, my computer told me it would get their faster by first class mail (which supposedly would have gotten there on Christmas Eve) than by Priority Mail (which it said would get there today, Dec. 26) — of course they don’t guarantee either way, so I was a bit skeptical about the first class schedule, but it will be interesting to see how far off their estimates are. Hope you are having a restful break and lots of merry fun. Oh, good! I thought I’d send you some samples of my “bread and butter” everyday tea. It’s not David’s, but it’s pretty good! Wow! Grandma, look at the wonderment on Grady’s face! Speaks volumes!!! It fills me up to see our world thru the eyes of a child! Great reminder. Love to “MY” Dentons!!! Have a peaceful happy Christmas! We send our love to you too, and wishes for a wonderful 2016. OK, will do…but I don’t know when I’ll get a minute. I’m drowning in all the stuff that piled up during the 2-week rush to Christmas. There ought to be some good ones to choose from, though. Grady was fascinated with Matt this time. It was so cute to hear him asking “Uncle Matt” this and “Uncle Matt” that. He (Grady) is at such a fun age now! Just tonight I was thinking of how things looked and smelled when I was a little girl. Merry Christmas and God bless. See you in 2016. Thank you Amy. I was thinking all this past week that you were already in Hawaii; I got the schedule mixed up. Merry Christmas to all the Hills, and Mele Kalikimaka too! Hope all is well. We are in CO at the moment. Leave here Thursday for HI. Will call when I get home. Love you much. Amy, thanks for the update — I couldn’t remember exactly when you would be where. Hau’oli Makahiki Hou! I loved all three cards, Julia and fun doing the puzzle at the end of the third one, too. I love puzzles. My dad was always working a puzzle and got my sister and I hooked early on. Sharon always has one going. Hey, I’m excited to know you are a puzzle fan. My sister and I both love them, too. I find jigsaw puzzles so relaxing. Matt spends hours and hours working puzzles from his vast collection of them. He has always liked them, but in his adult years they have become his primary pastime now that homework, piano and voice lessons are all history. I’m very thankful he has a hobby that interests him so much. As long as he has his beloved WHRO (public radio station here is the best we’ve had anywhere we’ve ever lived) and his puzzles, he is happy. I hope this finds you making merry! Another puzzle lover!!! My sister and I would stay up until 2 am trying to finish a challenging one. Now we trade puzzles between ourselves and two other friends. I’ve even done a few online ones like the one in your link, though its not as satisfying as the tactile pieces in your hand and finding that one “missing” piece after days of assembly. I’m delighted to read that Matt, too, is a fan. My sister has one going all the time. Its how she relaxes too. Does Matt have a preference in theme? Does he like the challenge of 1,000 pieces or does he prefer smaller ones? When Chris was a boy he showed zero interest in puzzles, no matter how often I introduced them. Then one day while I was working in the kitchen, I turned around and he had brought a puzzle to the floor and finished it in a couple of minutes. Then we were off: 12 pieces became 24 and then 48. Then right around the age of 3 he just as quickly lost interest and that was that. Alys, Matt is at his optimal level of challenge with a 500-750 piece puzzle. The 1000 pieces puzzles tend to overwhelm him, partly because he can’t spread all the pieces out into a small enough area that he can visually scan easily. So when he works one of 1000 pieces, I sort the pieces in advance for him and let him work on one section at a time. The more pieces the puzzle has, the more he needs lots of detail to be able to work it easily. We find that the best ones for him are the ones from White Mountain Puzzles (lots of history and nature puzzles) and Ravensburger, though he works all kinds. He has favorites of 300 pieces that are far too easy for him now, but I figured out what to do with his smaller puzzles that he doesn’t want to part with — I can mix the pieces of two or more of them together so that they give him a bit more challenge to work. Don’t you just love that moment when you find a piece that has eluded you for days? It seems like every time we work a big puzzle there’s that one piece that we think must SURELY have gotten lost somewhere, as we’ve been searching for it without success for so long. It’s lots of fun when it all starts to come together. Matt gets very driven when he is nearing the finish with any big puzzle. He doesn’t want to do anything but work on it every spare minute. I’m so glad he enjoys it! I know it’s a calming activity for his brain. Julia, what a great idea mixing pieces of two smaller puzzles. You’ve really mastered all the details to make the puzzle working approachable and fun. I love Ravensburger puzzles. They’re so well made and nice to assemble. I’ll have to explore the White Mountain Puzzles. I don’t know that brand but imagine they’re equally wonderful. I’m glad he enjoys it, and yes, calming indeed. The facility where I get my annual mammogram always has a puzzle going on one of the tables in the lobby. It’s great to sit and work a few pieces while waiting for the stressful exam. Alys, the White mountain puzzles are great because they come in so many different themes, and they have a lot of details, which makes them easy for Matt to work. But they have to be ordered online or found in small shops. I’ve never seen one in a large store. I wish more doctors would put puzzles in the reception area. So much more relaxing than a TV droning on or unappealing medical magazines everywhere. Nowadays I guess most people stay busy with their gadgets, but I’d choose the puzzle if I felt at all nervous or upset. TV’s in lobbies are one of my biggest pet peeves. Its invariable turned to a station I would never view at home, with something mundane. Years ago I was at Kaiser with my mom for one of her appointments and we had a 45 minute wait. They had Jerry Springer on the tube and a fight broke out. I could not believe it. My perfect lobby would have natural light, pots of brewed tea, assorted puzzles and soothing music turned to low. Alys, I agree! True confession time: have you ever turned one down? I do all the time, if nobody else is in the waiting area. BUT to my dismay, I find that more and more of them CAN’T be turned down! AS IF anyone needing to see a doctor should be expected to tolerate Jerry Springer! I have seen only about 30 seconds of that show, years ago when I was putting in a VCR tape for Matt and couldn’t figure out how to work it. The channel came on and it was Springer. They were fighting on the one I saw, too! That must happen all the time. It was actually pretty shocking, in terms of the content. Definitely not anything I wanted Matt to see even 30 seconds of. It reinforced my then-relatively-new refusal to ever watch TV. I love your business model and tag line, Julia. Brilliant! I have turned down the volume on TV before, but as you say, sometimes it requires a remote that’s been hidden behind a counter. I’m sorry Matt had to see even five seconds of Jerry Springer. I think he topped the worst of the worst on those early talk shows. It’s offensive and has no place in a hospital lobby. I think people must watch these type shows to feel better about themselves (“hey, I’m not as bad as THEY are” and that type thing — the opposite of how we feel when we see supermodels in fashion magazines! 😀 ). Or maybe it’s just the twenty-first century version of the circus sideshow. Either way, count me out! Good point, Julia. Count me out too. Merry Christmas to you Julia and Jeff and your family too. Your photo encapsulates the season all at once. Grady’s face lit by your beautiful tree makes for a photo he will cherish long into his adulthood. K, I haven’t been on FB much lately so thanks for flagging the message for me. I’m so glad your package got there in time for Christmas! Hey, I LOVE having Ukrainian Christmas! I never knew about it until you explained it to me. One thing I notice that has changed as I’ve gotten older, is that I enjoy the week AFTER Christmas as much or more than the week leading up to it. Thanks so much for your kind words. Boomdeeville will always be my happy place! As usual your photos and stories of your life bring a smile to my face. I’ve had a wonderful family experience this year for my first Christmas in New England. Graciously we were spared and bad weather as it hit 70 Christmas Eve. I’m grateful for all the folks that travelled this week to be with family. Thanks for sharing. Thank you Bob, I love it when people smile. I’ve always thought that a New England Christmas would be wonderful; I’m glad you have had an auspicious beginning to your holiday years on the east coast. Christmas, for me, is never without some sadness, but the beauty of it is that the joy always ends up winning the day. I suppose that’s the whole Christmas message in a nutshell. Hope 2016 is a great year for you! Ann, it made me so happy to think of you wearing a sweater “with bells on” (as the old saying used to go — was that a southern thing? “I’ll be there with bells on!”) Like you, I’m grateful for the bittersweet memories. Thank you for joining me in spirit by reading my blog on Christmas morning. I wish you a year full of blessings in 2016! I love that quote from Dickens; it’s one of my favorites. I’ve often said (only half joking) that I hoped people say that about me at my funeral. For me, Christmas is always an up and down time. It’s never pure fun. As much as I love it, it’s actually a huge medley of varying and sometimes conflicting emotions. I think the happiness quotient goes up in direct proportion to the presence of children, though, whether literally or inside our hearts, minds and memories. Hope you have a WONDERFUL holiday that ushers in a year full of joy in 2016. Beautiful cards, Julia. Love Jacquie Lawson cards. Wishing you and yours the Merriest Christmas ever and the Happiest, healthiest New Year. Giant hugs. Thank you Marlene! I’m glad you like the JL cards. I’ll have to send you some directly via email. Sending some of my own Giant Holiday Hugs right back to you! Sheila, maybe I should post a pic of my smoking Santa (not to be confused with the Smokin’ HOT Santa) so people can see what we are talking about, and you can compare and see if they, too, are twins separated at birth. On second thought, maybe a video would capture the smoke better. BTW my Smoking Santa came from SOUTHERN Germany. No joke. Jacquie Lawson’s cards are always magical and I thank you for sharing them. That photo of Grady, though? Perfect! Thank you LB! It’s easy to get good pics of Grady, except that it’s hard to catch him still.